Wide-field Infrared Survey Explorer (WISE, observatory code C51) is a NASA infrared-wavelength astronomical space telescope launched in December 2009, and placed in hibernation mode in February 2011. It was re-activated in 2013. WISE discovered thousands of minor planets and numerous star clusters. Its observations also supported the discovery of the first Y Dwarf and Earth trojan asteroid. WISE performed an all-sky astronomical survey with images in 3.4, 4.6, 12 and 22 μm wavelength range bands, over ten months using a 40 cm (16 in) diameter infrared telescope in Earth orbit. After its hydrogen coolant depleted, a four-month mission extension called NEOWISE was conducted to search for near-Earth objects such as comets and asteroids using its remaining capability. The All-Sky data including processed images, source catalogs and raw data, was released to the public on March 14, 2012, and is available at the Infrared Science Archive. In August 2013, NASA announced it would reactivate the WISE telescope for a new three-year mission to search for asteroids that could collide with Earth. Science operations and data processing for WISE and NEOWISE take place at the Infrared Processing and Analysis Center at the California Institute of Technology in Pasadena. The mission was planned to create infrared images of 99 percent of the sky, with at least eight images made of each position on the sky in order to increase accuracy. The spacecraft was placed in a 525 km (326 mi), circular, polar, Sun-synchronous orbit for its ten-month mission, during which it has taken 1.5 million images, one every 11 seconds. The satellite orbited above the terminator, its telescope pointing always to the opposite direction to the Earth, except for pointing towards the Moon, which was avoided, and its solar cells towards the Sun. Each image covers a 47-arcminute field of view, which means a 6-arcsecond resolution. Each area of the sky was scanned at least 10 times at the equator; the poles were scanned at theoretically every revolution due to the overlapping of the images. The produced image library contains data on the local Solar System, the Milky Way, and the more distant universe. Among the objects WISE studied are asteroids, cool, dim stars such as brown dwarfs, and the most luminous infrared galaxies. Stellar nurseries, which are covered by interstellar dust, are detectable in infrared, since at this wavelength electromagnetic radiation can penetrate the dust. Infrared measurements from the WISE astronomical survey have been particularly effective at unveiling previously undiscovered star clusters. Examples of such embedded star clusters are Camargo 18, Camargo 440, Majaess 101, and Majaess 116. In addition, galaxies of the young Universe and interacting galaxies, where star formation is intensive, are bright in infrared. On this wavelength the interstellar gas clouds are also detectable, as well as proto-planetary discs. WISE satellite was expected to find at least 1,000 of those proto-planetary discs. WISE was not able to detect Kuiper belt objects, because their temperatures are too low. It was able to detect any objects warmer than 70–100 K. A Neptune-sized object would be detectable out to 700 AU, a Jupiter-mass object out to 1 light year (63,000 AU), where it would still be within the Sun's zone of gravitational control. A larger object of 2–3 Jupiter masses would be visible at a distance of up to 7–10 light years. At the time of planning, it was estimated that WISE would detect about 300,000 main-belt asteroids, of which approximately 100,000 will be new, and some 700 near-Earth objects (NEO) including about 300 undiscovered. That translates to about 1000 new main-belt asteroids per day, and 1–3 NEOs per day. The peak of magnitude distribution for NEOs will be about 21–22 V. WISE would detect each typical Solar System object 10–12 times over about 36 hours in intervals of 3 hours. Construction of the WISE telescope was divided between Ball Aerospace & Technologies (spacecraft, operations support), SSG Precision Optronics, Inc. (telescope, optics, scan mirror), DRS and Rockwell (focal planes), Lockheed Martin (cryostat, cooling for the telescope), and Space Dynamics Laboratory (instruments, electronics, and testing). The program was managed through the Jet Propulsion Laboratory. The WISE instrument was built by the Space Dynamics Laboratory in Logan, Utah. The WISE spacecraft bus was built by Ball Aerospace and Technologies Corp. in Boulder, Colorado. 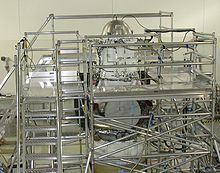 The spacecraft is derived from the Ball Aerospace RS-300 spacecraft architecture, particularly the NEXTSat spacecraft built for the successful Orbital Express mission launched on March 9, 2007. The flight system has an estimated mass of 560 kg (1,230 lb). The spacecraft is three-axis stabilized, with body-fixed solar arrays. It uses a high-gain antenna in the Ku band to transmit to the ground through the TDRSS geostationary system. Ball also performed the testing and flight system integration. WISE surveyed the sky in four wavelengths of the infrared band, at a very high sensitivity. Its design specified as goals that the full sky atlas of stacked images it produced have 5-sigma sensitivity limits of 120, 160, 650, and 2600 microjanskies (µJy) at 3.3, 4.7, 12, and 23 micrometers (aka microns). WISE achieved at least 68, 98, 860, and 5400 µJy 5-sigma sensitivity at 3.4, 4.6, 12, and 22 micrometers for the WISE All-Sky data release. This is a factor of 1,000 times better sensitivity than the survey completed in 1983 by the IRAS satellite in the 12 and 23 micrometers (micron) bands, and a factor of 500,000 times better than the 1990s survey by the Cosmic Background Explorer (COBE) satellite at 3.3 and 4.7 micrometers. On the other hand, IRAS could also observe 60 and 100 micron wavelengths. The primary mission lasted ten months: one month for checkout, six months for a full-sky survey, then an additional three months of survey until cryogenic coolant (which kept the instruments at 17 K) ran out. The partial second survey pass facilitated the study of changes (e.g. orbital movement) in observed objects. On November 8, 2007, the House Committee on Science and Technology's Subcommittee on Space and Aeronautics held a hearing to examine the status of NASA's Near-Earth Object (NEO) survey program. The prospect of using WISE was proposed by NASA officials. NASA officials told Committee staff that NASA plans to use WISE to detect near-Earth objects in addition to performing its science goals. It was projected that WISE could detect 400 NEOs (or roughly 2 percent of the estimated NEO population of interest) within its one-year mission. By October 2010, over 33,500 new asteroids and comets were discovered, and nearly 154,000 Solar System objects were observed by WISE. Discovery of an ultra-cool brown dwarf, WISEPC J045853.90+643451.9, about 10 to 30 light years away from Earth, was announced in late 2010 based on early data. In July 2011 it was announced that WISE had discovered the first Earth trojan asteroid, 2010 TK7. Also, the third-closest star system, Luhman 16. As of May 2018, WISE/NEOWISE has also discovered 290 near-Earth objects and comets (see section below). January 1999 — NGSS is one of five missions selected for a Phase A study, with an expected selection in late 1999 of two of these five missions for construction and launch, one in 2003 and another in 2004. Mission cost is estimated at $139 million at this time. March 1999 — WIRE infrared telescope spacecraft fails within hours of reaching orbit. October 1999 — Winners of MIDEX study are awarded, and NGSS is not selected. October 2001 — NGSS proposal is re-submitted to NASA as a MIDEX mission. April 2002 — NGSS proposal is accepted by the NASA Explorer office to proceed as one of four MIDEX programs for a Pre-Phase A study. December 2002 — NGSS changes its name to Wide-field Infrared Survey Explorer (WISE). March 2003 — NASA releases a press release announcing WISE has been selected for an Extended Phase-A study, leading to a decision in 2004 on whether to proceed with the development of the mission. April 2003 — Ball Aerospace is selected as the spacecraft provider for the WISE mission. April 2004 — WISE is selected as NASA's next MIDEX mission. WISE's cost is estimated at $208 million at this time. November 2004 — NASA selects the Space Dynamics Laboratory at Utah State University to build the telescope for WISE. October 2006 — WISE is confirmed for development by NASA and authorized to proceed with development. Mission cost at this time is estimated to be $300 million. December 14, 2009 — WISE successfully launched from Vandenberg Air Force Base, California. December 29, 2009 — WISE successfully jettisoned instrument cover. January 6, 2010 — WISE first light image released. January 14, 2010 — WISE begins its regular four wavelength survey scheduled for nine months duration. It is expected to cover 99% of the sky with overlapping images in the first 6 months and continuing with a second pass until the hydrogen coolant is exhausted about three months later. January 25, 2010 — WISE detects a never-before-seen near Earth asteroid, designated 2010 AB78. February 11, 2010 — WISE detects a previously unknown comet, designated P/2010 B2 (WISE). February 25, 2010 — WISE website reports it has surveyed over a quarter of the sky to a depth of 7 overlapping image frames. April 10, 2010 — WISE website reports it has surveyed over half of the sky to a depth of 7 overlapping image frames. May 26, 2010 — WISE website reports it has surveyed over three-quarters of the sky to a depth of 7 overlapping image frames. July 16, 2010 — Press release announces that total sky coverage will be completed on July 17, 2010. About half of the sky will be mapped again before the instrument's block of solid hydrogen coolant sublimes and is exhausted. October 2010 — WISE hydrogen coolant runs out. Start of NASA Planetary Division funded NEOWISE mission. January 2011 — Entire sky surveyed to an image density of at least 16+ frames (i.e. second scan of sky completed). February 17, 2011 — WISE Spacecraft transmitter turned off at 12:00 noon PST by Principal Investigator Ned Wright. The Spacecraft will remain in hibernation without ground contacts awaiting possible future use. April 14, 2011 — Preliminary release of data covering 57 percent of the sky as seen by WISE. July 27, 2011 — First Earth trojan asteroid discovered from WISE data. August 23, 2011 — WISE confirms the existence of a new class of brown dwarf, the Y dwarf. Some of these stars appear to have temperatures less than 300 K, close to room temperature at about 25C. Y dwarfs show ammonia absorption, in addition to methane and water absorption bands displayed by T dwarfs. March 14, 2012 — Release of the WISE All-Sky data to the scientific community. August 29, 2012 — WISE reveals millions of black-holes. September 20, 2012 — WISE was successfully contacted to check its status. August 21, 2013 — NASA announced it would recommission WISE with a new mission to search for asteroids. December 19, 2013 — NASA releases a new image taken by the reactivated WISE telescope, following an extended cooling down phase. The revived NeoWise mission is underway and collecting data. March 7, 2014 — NASA reports that WISE, after an exhaustive survey, has not been able to uncover any evidence of "Planet X", a hypothesized planet within the Solar System. April 26, 2014 — The Penn State Center for Exoplanets and Habitable Worlds reports that WISE has found the coldest known brown dwarf, between -48 and -13 degrees Celsius, 7.2 light years away from the Sun. The launch of the Delta II rocket carrying the WISE spacecraft was originally scheduled for December 11, 2009. This attempt was scrubbed to correct a problem with a booster rocket steering engine. The launch was then rescheduled for December 14, 2009. The second attempt launched on time at 14:09:33 UTC (06:09 local PST) from Vandenberg Air Force Base in California. The rocket successfully placed the WISE spacecraft into the planned polar orbit at an altitude of 326 miles (525 km) above the Earth. WISE avoided the problem that affected Wide Field Infrared Explorer (WIRE), which failed within hours of reaching orbit in March 1999. In addition, WISE was 1,000 times more sensitive than prior surveys such as IRAS, AKARI, and COBE's DIRBE. A month-long checkout after launch found all spacecraft systems functioning normally and both the low- and high-rate data links to the operations center working properly. The instrument cover was successfully jettisoned on December 29, 2009. A first light image was released on January 6, 2010: an eight-second exposure in the Carina constellation showing infrared light in false color from three of WISE's four wavelength bands: Blue, green and red corresponding to 3.4, 4.6, and 12 micrometers, respectively. On January 14, 2010, the WISE mission started its official sky survey. The WISE group's bid for continued funding for an extended "warm mission" scored low by a NASA review board, in part because of a lack of outside groups publishing on WISE Data. Such a mission would have allowed use of the 3.4 and 4.6 micrometers detectors after the last of cryo-coolant had been exhausted, with the goal of completing a second sky survey to detect additional objects and obtain parallax data on putative brown dwarf stars. NASA extended the mission in October 2010 to search for near-Earth objects. By October 2010, over 33,500 new asteroids and comets were discovered, and over 154,000 Solar System objects were observed by WISE. While active it found dozens of previously unknown asteroids every day. In total, it captured more than 2.7 million images during its primary mission. In October 2010, NASA extended the mission by one month with a program called Near-Earth Object WISE (NEOWISE). Due to its success, the program was extended a further three months. The focus was to look for asteroids and comets close to Earth orbit, using the remaining post-cryogenic detection capability (two of four detectors on WISE work without cryogen). In February 2011, NASA announced that NEOWISE had discovered many new objects in the Solar System, including twenty comets. During its primary and extended missions, the spacecraft delivered characterizations of 158,000 minor planets, including more than 35,000 newly discovered objects. After completing a full scan of the asteroid belt for the NEOWISE mission, the spacecraft was put into hibernation on February 1, 2011. The spacecraft was briefly contacted to check its status on September 20, 2012. On August 21, 2013, NASA announced it would recommission WISE to continue its search for near-Earth objects and potentially dangerous asteroids. It would additionally search for asteroids that a robotic spacecraft could intercept and redirect to orbit the Moon. The extended mission would be for three years at a cost of $5 million per year, and was brought about in part due to calls for NASA to step up asteroid detection after the Chelyabinsk meteor exploded over Russia in February 2013. WISE was successfully taken out of hibernation in September 2013. With its coolant depleted, the spacecraft's temperature was reduced from 200 K (−73 °C; −100 °F)—a relatively high temperature resulting from its hibernation—to an operating temperature of 75 K (−198.2 °C; −324.7 °F) by having the telescope stare into deep space. Its instruments were then re-calibrated, and the first post-hibernation photograph was taken on December 19, 2013. The post-hibernation NEOWISE mission was anticipated to discover 150 previously unknown near-Earth objects and to learn more about the characteristics of 2,000 known asteroids. Few objects smaller than 100 m (330 ft) in diameter were detected by NEOWISE's automated detection software, known as the WISE Moving Object Processing Software (WMOPS), because it requires five or more detections to be reported. The average albedo of asteroids larger than 100 meters discovered by NEOWISE is 0.14. Of the 262 near-Earth asteroids (NEAs), 47 of them are considered potentially hazardous asteroids (PHAs), a subset of the much larger family of NEOs, but particularly more likely to hit Earth and cause significant destruction. NEOs can be divided into NECs (comets only) and NEAs (asteroids only), and further into subcategories such as Atira or Apohele asteroids, Aten asteroids, Apollo asteroids, Amor asteroids and the potentially hazardous asteroids (PHAs). On April 14, 2011, a preliminary release of WISE data was made public, covering 57 percent of the sky observed by the spacecraft. On March 14, 2012, a new atlas and catalog of the entire infrared sky as imaged by WISE was released to the astronomic community. On July 31, 2012, NEOWISE Post-Cryo Preliminary Data was released. A release called AllWISE, combining all data, was released on November 13, 2013. NEOWISE data is released annually. In 2018, the reliability of the data was challenged in a paper by Nathan Myhrvold, who stated that the NEOWISE data suffers from systemic errors due to the spacecraft being designed to observe very distant objects rather than asteroids in the Solar System. −1.3 light-years was suspected to be closest brown dwarf on the list of nearest stars (also see § Map with nearby WISE stars). For a more comprehensive list, see List of minor planets discovered using the WISE spacecraft. ^ a b c d e f g "Wide-field Infrared Survey Explorer Launch" (PDF). NASA. December 2009. Retrieved May 22, 2015. ^ "WISE". N2YO. May 21, 2015. Retrieved May 22, 2015. ^ Ray, Justin (December 14, 2008). "Mission Status Center: Delta/WISE". Spaceflight Now. Retrieved December 26, 2009. ^ Rebecca Whatmore; Brian Dunbar (December 14, 2009). "WISE". NASA. Retrieved December 26, 2009. ^ a b Clavin, Whitney (December 14, 2009). "NASA's WISE Eye on the Universe Begins All-Sky Survey Mission". NASA Jet Propulsion Laboratory. Retrieved December 26, 2009. ^ a b c d e f g "Wide-field Infrared Survey Explorer". Astro.ucla.edu. Retrieved August 24, 2013. ^ a b c d Reuters (August 22, 2013). "NASA space telescope rebooted as asteroid hunter". CBC News. Retrieved August 22, 2013. ^ a b "JPL – NASA's WISE Finds Earth's First Trojan Asteroid (July 27, 2011)". Jpl.nasa.gov. July 27, 2011. Retrieved August 24, 2013. ^ a b "Berkeley – NASA's WISE Finds Earth's First Trojan Asteroid (July 27, 2011)". Wise.ssl.berkeley.edu. Retrieved August 24, 2013. ^ a b "WISE Public Web Site – UCLA". Astro.ucla.edu. Retrieved August 24, 2013. ^ a b Morse, Jon. "Discovered: Stars as Cool as the Human Body". Retrieved August 24, 2011. ^ a b Majaess, Daniel J. (March 2013). "Discovering protostars and their host clusters via WISE". Astrophysics and Space Science. 344 (1): 175–186. arXiv:1211.4032. Bibcode:2013Ap&SS.344..175M. doi:10.1007/s10509-012-1308-y. ^ "Wide-field Infrared Survey Explorer (WISE)". Astro.ucla.edu. Retrieved August 24, 2013. ^ a b c d e f Debra Werner (October 5, 2010). "Last-minute Reprieve Extends WISE Mission". Space News. Retrieved October 29, 2010. ^ "WISE All-Sky Data Release". Wise2.ipac.caltech.edu. Retrieved August 24, 2013. ^ "NASA Releases New WISE Mission Catalog of Entire Infrared Sky". Nasa.gov. Retrieved August 24, 2013. ^ Clavin, Whitney (July 18, 2011). "Can WISE Find the Hypothetical 'Tyche'?". NASA.gov. Retrieved July 19, 2011. ^ "The Wide-field Infrared Survey Explorer All-Sky Data Release March 14, 2012". The Wide-field Infrared Survey Explorer at IPAC. Retrieved March 17, 2012. ^ Griggs, Brandon (December 14, 2009). "NASA launches infrared telescope to scan entire sky". CNN. Turner Broadcasting. Retrieved December 26, 2009. ^ a b "Posting on Minor Planet Mailing List by Amy Mainzer, principal investigator (WISE NEO Section)". Tech.groups.yahoo.com. Retrieved August 24, 2013. ^ Camargo, Denilso; Bica, Eduardo; Bonatto, Charles (January 2015). "New Galactic embedded clusters and candidates from a WISE Survey". New Astronomy. 34: 84–97. arXiv:1406.3099. Bibcode:2015NewA...34...84C. doi:10.1016/j.newast.2014.05.007. ^ Camargo, Denilso; Bica, Eduardo; Bonatto, Charles (July 2013). "Towards a census of the Galactic anticentre star clusters - III. Tracing the spiral structure in the outer disc". Monthly Notices of the Royal Astronomical Society. 432 (4): 3349–3360. arXiv:1505.01829. Bibcode:2013MNRAS.432.3349C. doi:10.1093/mnras/stt703. ^ a b Lakdawalla, Emily (August 27, 2009). "The Planetary Society Blog: "WISE Guys"". The Planetary Society. Retrieved December 26, 2009. ^ a b c Mainzer, Amanda K.; Eisenhardt, Peter; Wright, Edward L.; Liu, Feng-Chuan; Irace, William; Heinrichsen, Ingolf; Cutri, Roc; Duval, Valerie (August 10, 2005). MacEwen, Howard A. (ed.). "Preliminary design of the Wide-field Infrared Survey Explorer (WISE)" (PDF). Proceedings of the SPIE – UV/Optical/IR Space Telescopes: Innovative Technologies and Concepts II. 5899: 262–273. Retrieved March 5, 2010. ^ Roc Cutri; et al. (March 14, 2012). "Explanatory Supplement to the WISE All-Sky Data Release Products". CalTech Infrared Processing and Analysis Center. Retrieved November 17, 2014. ^ Schmadel, Lutz D. (2003). Dictionary of minor planet names. Berlin; New York: Springer. p. 315. ISBN 978-3-540-29925-7. ^ Rebecca Whatmore (December 10, 2009). "NASA's Wide-field Infrared Survey Explorer". NASA Jet Propulsion Laboratory. Retrieved December 26, 2009. ^ United States House Committee on Science and Technology (November 7, 2007). "Hearing Charter: Near-Earth Objects: Status of the Survey Program and Review of NASA's 2007 Report to Congress". SpaceRef. Retrieved December 25, 2009. ^ a b Lisa Grossman (October 5, 2010). "Top 10 Deep-Space Photos From Infrared Telescope's Final Days". Wired Science. Retrieved October 29, 2010. ^ Gugliucci, Nicole (November 18, 2010). "Infrared Telescopes Find Ultra-Cool Brown Dwarf". Discovery News. Archived from the original on July 11, 2012. ^ Choi, Charles Q. (July 27, 2011). "First Asteroid Companion of Earth Discovered at Last". Space.com. Retrieved August 24, 2013. ^ a b c "WISE NEA/Comet Discovery Statistics". NASA/JPL. Retrieved May 15, 2018. ^ Michael Cooney (January 26, 2010). "NASA space telescope spots asteroid". Techworld. Retrieved February 21, 2010. ^ "WISE Spies a Comet with its Powerful Infrared Eye". NASA. Retrieved February 11, 2010. ^ "NASA's WISE Mission to Complete Extensive Sky Survey". Jpl.nasa.gov. Retrieved August 24, 2013. ^ "WISE – News & Events: The WISE Spacecraft transmitter was turned off for the final time". February 17, 2011. Retrieved February 19, 2011. ^ "Mapping the Infrared Universe: Part 1". April 14, 2011. Retrieved July 6, 2011. ^ a b "NASA Releases New WISE Mission Catalog of Entire Infrared Sky". Nasa JPL. March 14, 2012. Retrieved March 15, 2012. ^ "NASA's WISE Survey Uncovers Millions of Black Holes". Nasa.gov. August 29, 2012. Retrieved August 24, 2013. ^ Clavin, Whitney; Harrington, J.D. (March 7, 2014). "NASA's WISE Survey Finds Thousands of New Stars, But No 'Planet X'". NASA. Retrieved March 7, 2014. ^ Nayan, Kamal (April 26, 2014). "Research Discover a Cold, Close Neighbor Of the Sun". Retrieved April 26, 2014. ^ Staff (May 21, 2015). "WISE spacecraft discovers most luminous galaxy in universe". PhysOrg. Retrieved May 22, 2015. ^ Staff (May 21, 2015). "PIA19339: Dusty 'Sunrise' at Core of Galaxy (Artist's Concept)". NASA. Retrieved May 21, 2015. ^ Whitney Clavin (December 10, 2009). "Mission News: WISE Launch Rescheduled for December 14". NASA. Retrieved December 23, 2009. ^ William Graham (December 14, 2009). "ULA Delta II Successfully Launches with WISE". NASASpaceFlight.com. Retrieved December 26, 2009. ^ Whitney Clavin (December 29, 2009). "NASA's WISE Space Telescope Jettisons Its Cover". NASA. Retrieved December 29, 2009. ^ "WISE 'First-Light' Image". NASA. January 6, 2010. Retrieved January 6, 2010. ^ "WISE – News & Events". NASA. February 11, 2010. Retrieved February 21, 2010. ^ Coulter, Dauna (March 26, 2010). "An Avalanche of Dark Asteroids". Science@NASA. NASA. Archived from the original on July 14, 2012. ^ a b c d Netburn, Deborah (August 22, 2013). "Going asteroid hunting: NASA wakes telescope from 2 1/2-year nap". Los Angeles Times. Retrieved August 23, 2013. ^ "NASA's NEOWISE Completes Scan for Asteroids and Comets". February 1, 2011. Retrieved February 3, 2011. ^ Poladian, Charles (March 3, 2014). "NASA NEOWISE Spacecraft Discovers A New Comet, C/2014 C3 Spotted 143 Million Miles From Earth". International Business Times. Retrieved April 30, 2014. ^ Agle, D. C. (November 11, 2015). "Secondhand Spacecraft Has Firsthand Asteroid Experience". NASA. Retrieved November 12, 2015. ^ Clavin, Whitney; Perrotto, Trent J. (February 1, 2011). "NASA's NEOWISE Completes Scan for Asteroids and Comets". NASA/Jet Propulsion Laboratory. Retrieved November 12, 2016. ^ a b Wall, Mike (December 19, 2013). "Reactivated NASA Asteroid-Hunting Probe Takes First Photos in 2.5 Years". Space.com. Retrieved November 12, 2016. ^ Agle, D. C.; Brown, Dwayne (August 21, 2013). "NASA Spacecraft Reactivated to Hunt for Asteroids". NASA/Jet Propulsion Laboratory. Retrieved November 12, 2016. ^ a b Mainzer, Amy; Bauer, J.; Grav, T.; Masiero, J. (2014). "The Population of Tiny Near-Earth Objects Observed by NEOWISE". The Astrophysical Journal. 784 (2). arXiv:1310.2980. Bibcode:2014ApJ...784..110M. doi:10.1088/0004-637X/784/2/110. ^ "WISE NEA/NEO Groups". NASA / JPL. Retrieved August 1, 2015. ^ "WISE Delivers Millions of Galaxies, Stars, Asteroids". April 14, 2011. Retrieved July 6, 2011. 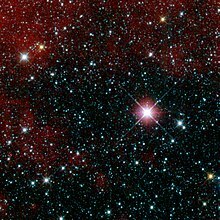 ^ a b "Wide-field Infrared Survey Explorer (WISE) and NEOWISE". NASA/IPAC Infrared Science Archive. April 19, 2018. Retrieved May 15, 2018. ^ Myhrvold, Nathan (November 2018). "An empirical examination of WISE/NEOWISE asteroid analysis and results". Icarus. 314: 64–97. Bibcode:2018Icar..314...64M. doi:10.1016/j.icarus.2018.05.004. ^ Chang, Kenneth (June 14, 2018). "Asteroids and Adversaries: Challenging What NASA Knows About Space Rocks". The New York Times. Retrieved June 14, 2018. ^ Marsh, Kenneth A.; et al. (2013). "Parallaxes and Proper Motions of Ultracool Brown Dwarfs of Spectral Types Y and Late T". The Astrophysical Journal. 762 (2): 119. arXiv:1211.6977. Bibcode:2013ApJ...762..119M. doi:10.1088/0004-637X/762/2/119. ^ "Minor Planet Discoverers (by number)". Minor Planet Center. January 12, 2017. Retrieved February 3, 2017. Wikimedia Commons has media related to Wide-field Infrared Survey Explorer.